It’s been a season and a half since my last post so we’ve got a lot of ground to cover. There’s no time for regrets! I’ve been so busy doing projects there’s been nary a moment to write about them. Still, we must travel back in time to autumn so I can present my fall foraging quest. In much of the world I know there’s precious little land left where foraging is safe, legal, and accessible. As viewed from a plane, every inch of land is gridded and fenced, known and owned. But urban foragers and rural gleaners persevere. And among them evolves the guerrilla forager. Acorns: more than enough for me and the squirrels. I gathered most in late August and September, best after a good wind storm has knocked the fresh ones down. My young friend Vivian and I collected basketfuls, then set about the process of cracking the shells, pulling out the nut meats, composting the wormy ones, and grinding the good ones into nut paste. 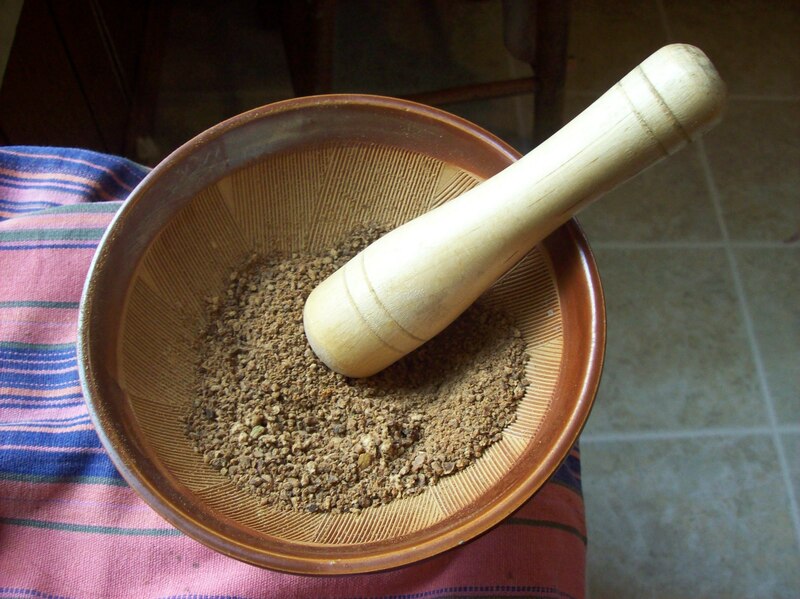 After that we dry the nut paste and grind it into a finer flour with a mortar and pestle or a food processor. The final step is to leach the tannins out of the flour using a homemade sieve. The result is a few jars of tasty, nutty, acorn flour to bake with. A future post will detail the acorn flour process in depth. Elderberries: elderberries make an excellent throat soothing, immune boosting tea and syrup for winter ills. Some really nice person at our local natural pharmacy saw me purchasing a bag of them and told me we had bushes growing along the bike path over the river and it was almost harvest time. Again Vivian and I set off on bikes to search out the dark purple bundles of berries. They have telltale clusters like small grapes on a tall bush or low tree. Please look them up in a book on wild foraging or a trusted website to make sure you can identify properly. The redder variety is dangerous. Also, IMPORTANT: while the berries are great for you, the red stems of the berries are TOXIC. When I processed them I very carefully plucked each berry from its stem and went through the batch several times to make sure I hadn’t missed any stem bits. This is not difficult work, just time consuming. But elderberries are quite expensive and the half pound I harvested will last me well into the winter. Rosehips: Again, a lovely tea herb for its tangy taste and high vitamin C content. I have a bush in the backyard, complete with the tree stump and mushroom colony. Wait until after the first good frost before harvesting. Some I used fresh, and some I cut open to remove the seeds so they can dry and be stored. Any rosebush will yield rosehips. While my backyard bush offered many fine, tiny rosehips, their flavor was unfortunately bland when steeped in tea. 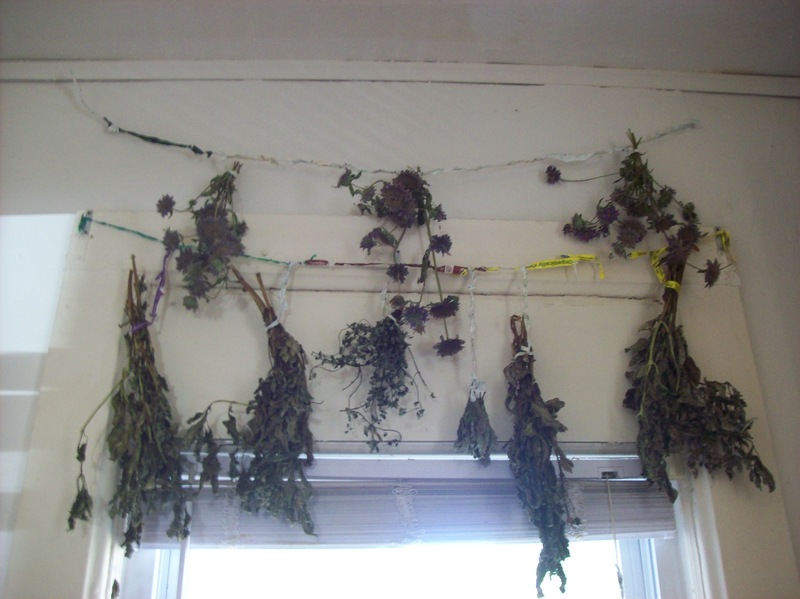 Herbs: I gathered up my neighbors’ basil, with permission, right before it bolted and went to seed. It lasted my six person householdabout three months. By accident, my ladylove found catnip growing by our doctor’s office. She brought me a flower and my cat ate it. Before it snowed we harvested what was left and dried it for winter cat entertainment. The previous tenants in our house planted oregano and chives in the garden, which survived and returned after our first winter. We’re just now using up what we harvested in the summer. Pears: I harvested pears from a friend’s family home in the country. Though they’d never been sprayed with a pesticide or herbicide,they were remarkably bug and blemish free. These beautiful red Bartlett pears made jars and jars of pear sauce. I froze it in mason jars in the deep freezer and thaw it out for baking pies and muffins. Fall dandelion greens: spring and fall are great times for harvesting this tasty and medicinal green veggie. Dandelions are least bitter when new leaves sprout before or after blooming and seeding. Plantain: not the banana thing! Plantain is a low green yard plant with oblong leaves that are very good at soothing and healing skin wounds and burns. They are also a tasty salad vegetable. Black walnuts: the nuts are edible, if hard to get to. I like to use the hulls, which turn black and crumple off the shells. The hulls can be used for a rich, brown fabric dye. They can also be used to make a tea or tincture that kills intestinal parasites, but be careful, it’s a poison, that’s why it works. The first trouble with not-so-wild urban foraging is the use of pesticides. You can get some information from the city you live in about what parks get sprayed with what. This should be public information. Most places post signs when pesticides have been used. The signs should list the type of cide used, the last date applied, and maybe even its indication (such as “on stumps of invasive trees”). Do your own research and use your best judgment. If you are concerned about contamination or toxicity avoid gathering from the sides of busy roads (fallout zone for automotive pollutants), railroad tracks (where creosote and herbicides are used), and super-landscaped areas (pesticides, herbicides, fertilizers, parking lot run-off). Sometimes I still gather from these places, depending on what I’m gathering, when, what’s around, and if it’s for eating or dying or smelling, etc. Also, consider what your neighbors use on their lawns and gardens if you gather from people’s houses. Bacterial contamination. Don’t harvest from dog parks or places where animals defecate a lot, no matter how good the plantain looks. Legality issues. Urban foraging is not really legal. In some cases it’s stealing. In some cases it is damaging property. There are many tried and true means of dealing with this issue. Ask permission. When you see your neighbor with 25 square feet of lemon mint in their yard, or a pear tree that drops all its fruit on the sidewalk, ask if they’d mind if you harvest some. Most people will be happy to say yes, maybe even relieved to have someone else help them deal with the overload. Offer to share some pear sauce or dried lemon mint tea after you process it. Many people have grown fantastic relationships by simply asking, and there are websites devoted to organizing the gleaning/foraging networks in cities. Go guerrilla. When you can’t get permission from a land owner, such as the case of an urban park, or corporate lot, use these guerrilla tactics. Act natural. 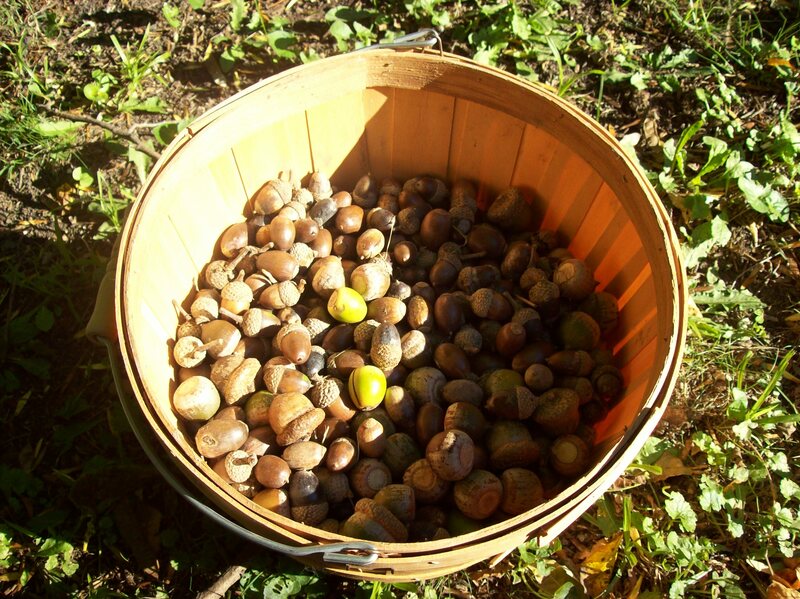 I harvested acorns during the day in the public park and the church yard. Only the squirrels minded. If someone asks what you’re doing, tell the truth and be jolly about it. There’s nothing wrong with using the edible products of nature. Offer to share with whomever is questioning you. If asked to leave private property, go. Wait till after dark. You are a ninja forager. Get more info on guerrilla gardening here. And it harm none, do what you will. The Witches’ creed. Also the oath of physicians: first, harm not. This means, ask yourself if foraging something is going to harm anyone, including animals and plants. Ask the plant for permission. Asking the plant, or the plant spirit, if you can harvest some of its fruits, can be a wonderful way to connect with the natural world, your food source, and with yourself. This is a powerful way to practice asking for consent (something we all need more practice in). I always ask a plant before I take, and then I listen for an answer. How do you listen to a plant? There are lots of ways. You can close your eyes and just see what happens. You can take some time to observe the environment of the plant and read the signs. For example, is the fruit ripe and ready? Is there some on the ground you can take before you pick from the bush? What animals are around the area? Will you be leaving enough for the creatures that depend on this food source and don’t have access to supermarkets? Will you be damaging the plant by harvesting, such as breaking a branch to get the good fruit, or trampling delicate things underfoot? Foraging is an opportunity to experience everyday harmony with other living entities. Sometimes when I ask permission of a plant, take the time to look around, and listen, the answer is no, it’s not okay to harvest now. No matter how wonderful those apples at the top of the tree look, or how convenient it would be for me to pick those berries now, it is imperative that we observe the answer we get, whether or not we know it came from the plant or from within us. Take the time to come back with a ladder, or wait another week until the fruit is ready to fall with a gentle shaking of the tree, or acknowledge the birds who need the harvest more. If you want it fast and easy, go to the grocery store. Don’t take everything. Plants are so generous, they make food and medicine for us, and without them, we could not exist. Leave at least half of every plant, unless it’s a root vegetable I suppose, and never take all the plants growing in one area. Imagine all the other creatures that might eat a given plant. Leave an offering. Offering is sacred. If I take a lot of elderberries, I may bring a little bag of birdseed or sunflower seeds and scatter them around. I used to take a bag of my own homemade compost around and give a little to each plant I’d harvested from. Now we’re talking about stewardship and guerrilla gardening, a post for another time. I don’t always make a tangible offering, sometimes I just offer thanks and a blessing. Kids can really enjoy foraging. Each excursion is an adventure with treasure to be found. Collecting is fun. Learning to identify plants is fun. Feeling empowered to provide your own food is fun. Watching kids talk to plants and thank them is amazing and builds compassionate bonds with nature. Bringing thank you gifts to plants is really wonderful. 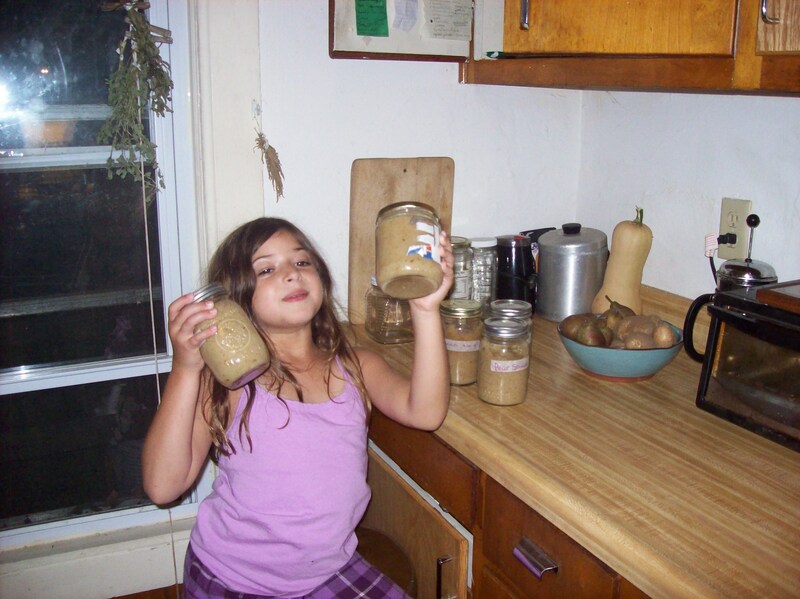 Making delicious things out of what you harvested is very gratifying for little and big people alike. When foraging with kids, be flexible, keep it light and fun, don’t do anything dangerous or disrespectful, demonstrate kindness and share the ethical guidelines. Kids are often more open to communicating with plant spririts. Try visiting the same places at different times of the year to see how plants develop through the seasons and watch your food growing! That’s all for now, folks. To whet your whistle, upcoming posts might include: winter foraging, fall wood building projects, winter crafting, winter cooking and baking, DIY chocolate, and a discussion of information access (FreeSchools, zines, public libraries, self-publishing, mini-libraries, etc).